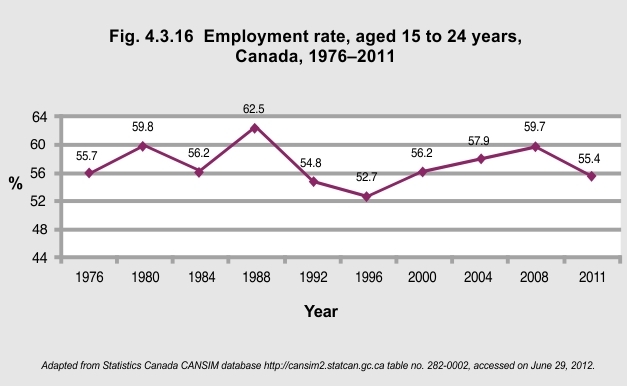 Although the employment rate for youth 15 to 24 years of age has fluctuated over time, the rate in 2011 was just slightly less than that of the rate in 1976. However, the composition of employment for this group changed significantly. In 1976, 78.9% of employed youth worked full time and the other 21.1% worked part time; in 2011, 52.6% of employed youth worked full time and the other 47.4% worked part time. 1Marshall K. (2007). “General Social Survey, Perspectives on Labour and Income: The Busy Lives of Teens.” Statistics Canada. http://www.statcan.gc.ca/pub/75-001-x/75-001-x2007105-eng.pdf – accessed on June 29, 2012.